What could be more beautiful than the ocean? The colors, the sea life, the waves - they all combine to make a marvelous inspiration for a wedding. Find out how to plan a wonderful ocean theme wedding. A great place to start with an ocean theme is with your wedding colors. Cool water shades like turquoise, aqua, cerulean, and seafoam green all combine harmoniously into a gorgeous color palette. If you like, you can add the occasional pop of coral color for contrast. It would be wonderful to have your bridesmaids choose dresses in an array of ocean colors, each in a slightly different hue. Softly flowing fabrics like chiffon will have a great movement like the sea. The bride can choose her favorite ocean color for a sash on her wedding gown, or shop for bridal jewelry sets in watery hues. It is also possible to order custom bridal jewelry sets made in an array of seaglass colored crystals for a lovely accessory. Seafood is a natural choice for an ocean theme wedding. Feature a seafood bar at the cocktail hour, with plenty of shrimp, crab claws, and oysters. For the main course at the wedding dinner, offer a freshly prepared fish dish. Salmon and tilapia tend to be widely liked by most people. You may wish to offer an alternative like chicken or pasta for guests who do not care for fish. It would be fun to serve dinner on china with a sea life motif, such as coral or sea horses. Choosing special china is a great way to reinforce your wedding theme and make your wedding look more beautiful. Tropical fish are one of the most spectacular things about the ocean. 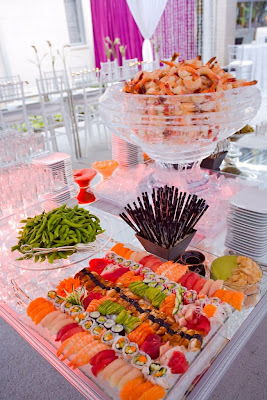 Imagine how gorgeous it would look to have a large display of colorful fish at your wedding reception. You could bring in a large tank to put on display at the bar or along one wall of the reception room. Better yet, look into having your wedding in a location that already has tropical fish on display. Sometimes resort hotels have whole walls of fish tanks. It may also be possible to host your wedding in a local aquarium. Many aquariums are available to rent for events after they close for the day. You could exchange your vows in front of a tank of your favorite fish or even surprise your guests by having the ceremony in front of the shark tank! 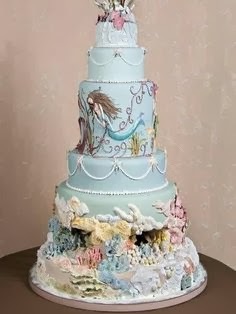 The wedding cake is another place where you can really make your ocean theme come to life. 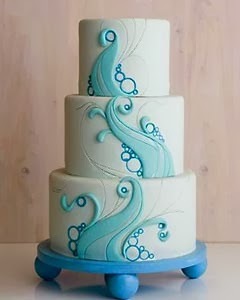 It would be beautiful to have a cake decorated with a wave pattern in shades of blue and green. It's a subtle way to use the theme. If you prefer something a bit more elaborate, ask your baker to decorate your wedding cake with your favorite ocean motif. You could have sea horses in rows around the tiers of the cake, vibrant fish swimming around, or even a cute pair of crabs on top of the cake holding wedding rings in their claws! 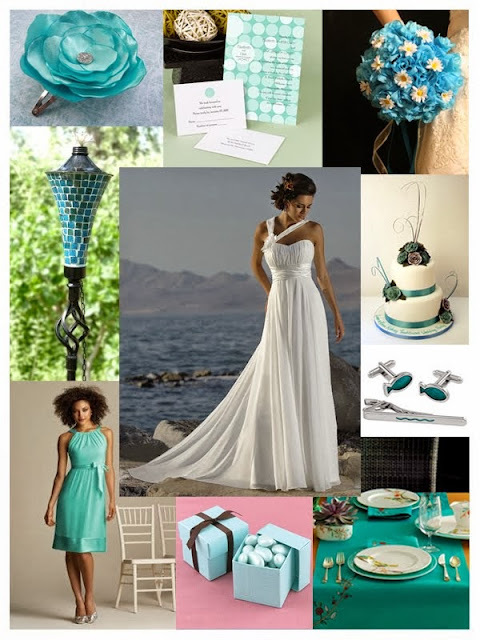 An ocean theme is a lovely choice for a wedding. The colors are very appealing, the motifs fun to use, and the accent pieces easy to come by. Definitely consider an ocean theme for your wedding if you are looking for a beautiful inspiration for your wedding plans.